This section is organized thematically in major topics accessible from the menu on the left. Please use your browser's search command (e.g. Edit | Find on page <Ctrl+F>) to locate a keyword relevant to your question. A2. What are the minimum system requirements to run xplorer² ? xplorer² will run in a basic trim on all win32 platforms (95/98/ME/NT4/2000/XP/ 2003/Vista/Win7/8/10), however a subset of its features depend on windows services that may or may not be available on all PCs. In many cases you can get full functionality by installing a recent version of Internet Explorer. Early Windows 95 users can install the common control update to get basic toolbars without installing internet explorer. A3. I've just received my registration key, where do I type it? Please copy/paste the key as you have received it via email. If you continue having problems please contact support quoting the exact error message reported by the license manager. For more help click here. Please make sure you are using the correct key for your installed xplorer² version. Old v1.x keys won't unlock any later versions, and likewise 2.x keys won't work for v3.x (see the upgrade guide). If you bought a professional license make sure you are running xplorer² professional (and vice versa if you bought an ultimate license). You can check which version you are running using Help | About menu command. A5. 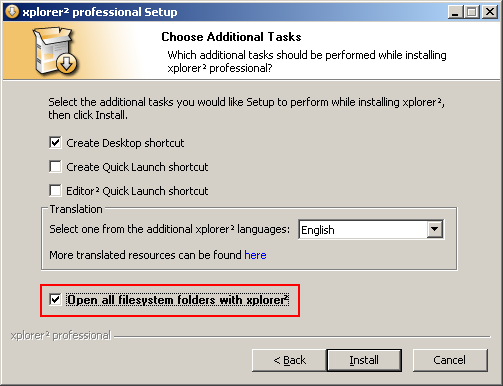 Do I need administrator privileges to install xplorer²? This is by design. To continue on a trial basis, click on continue button. You have 21 days of free evaluation and a further 10 days with a few extra nags. Once you buy a key you won't see any more nag messages. Have you installed xplorer² on your machine before? If so the trial has most probably expired, since it counts from the original installation date. If it is a fresh installation there could be some problem with your system clock; please submit a problem report for further information. A8. Do I get any free upgrades at all? Your single user license entitles you to customer support and free upgrades for one year. From then on you may incur surcharges for future xplorer² upgrades. For peace of mind please consider the lifetime upgrade assurance. Normally when you order by credit card you get your key immediately. Sometimes due to essential credit card checks, orders can be delayed 1-2 days. You can avoid most such delays if you use a "good" contact email address — as opposed to a hotmail/yahoo account. A valid email will also ensure you will stay informed on future developments, bugfixes etc. If you have a strict spam filter the registration email may blocked — please check your spam mail folder. The most likely cause is that you are running the lite version of xplorer² (check Help | About dialog). The professional version is a completely different program, and is the only one that accepts registration keys. Please download the "pro" version and install it separately. A12. How can I become an affiliate partner? If you are a webmaster or other person skilled in sales you can earn up to 40% commission by promoting xplorer² sales. To register as an affiliate please follow this link. A13. I'm an existing customer; how do I upgrade? In general you can just download the latest trial version from the website and install it on top of your existing xplorer² (no uninstall required). This will ensure your old settings and registration information is preserved. Note that if you have an older registration key you cannot use it a later version, please refer to this upgrade guide. A14. How can I stay informed on xplorer² developments? To keep up to date with new releases, upgrades, tips and tricks and other useful information just send us your email address. Nearly every page in the website contains a yellow box where you can enter your details for this purpose. Alternatively you can subscribe to the RSS feed. You can also follow us on twitter follow @zabkat or via our facebook page. A15. Does xplorer² require online activation? No. xplorer² never "calls home", neither during registration nor during normal use, unless you explicitly check for product updates (Help menu). But please observe the fair usage terms in the license agreement. A19. Does xplorer² work on 64 bit windows? If you have some old 32 bit shell extensions you'll need the 32 bit xplorer² version too, which also works on vista/W7/W8/W10 64 and windows XP 64. A21. Do I need a separate license for xplorer² 64 bit? No. The key you buy for xplorer² unlocks both the 32 and 64 bit version. One key is also good enough for all installations you make both in real and virtual machines, as long as you observe the one key, one user rule. A22. How do I setup my ultimate edition on a portable USB stick? For easy step by step instructions please refer to the documentation →. B1. How can I map a network drive or format disks? B2. Why can't I format a floppy disk? Windows will refuse to format a disk that some program have a lock on. A certain recipe for disaster therefore would be to be browsing the root "A:\", and then hit <Bksp> to access "My Computer" where the floppy disk icon resides (bearing the Format context menu command), since xplorer² current directory would still be on the floppy ("My Computer" is not a filesystem folder). There are many workarounds that one can imagine, but the easiest would be to go upwards to "My Computer" from another root drive as e.g. "C:\". Naturally you should also make sure that no other program is accessing the floppy drive too. This is another issue related to resources being in use. If you are browsing a folder in one of the list view panes then it is considered "locked" and you can't permanently delete it. So please make sure you are not browsing the folder in any program, including within xplorer². On the other hand you should be able to delete a folder to the recycle bin without problems. If you must delete from the tree you have to check "Don't lock browsed folder" box in Tools | Options | Advanced, but note that it will have repercussions in command line execution (no current directory). B4. How can I have zipfolders on Windows 2000? Hard links are only supported for NTFS partitions. Hence windows 9x or NT with FAT32 partitions, floppy discs etc are not covered. Even for NTFS partitions there are limitations; the files thus linked must reside in the same partition. It is not possible to place a hard link in e.g. "C:\" for a file located on a mapped network drive. This is another advanced feature that can be used only on NTFS formatted partitions. You can't set comments e.g. for files on floppy disks and other FAT32 media. On the other hand you can set comments for all folders and microsoft office documents, even for FAT-formatted media. Since file comments most of the time rely on NTFS, when you copy files to non-NTFS media comments will be lost. Windows is warning you in advance for this potential loss of information. If you want to transfer files on e.g. a floppy without losing the comments please use Actions | ADS | Bundle to go command. After the transfer to the target NTFS folder, use Actions | ADS | Unpack bundle to restore the files. B8. How can I tell if my hard disk is NTFS? If you are running windows ME or earlier 9x, then your disks are definitely not NTFS. If you are running on NT4/2000/XP/Vista/W7/W8/W10 you'll need to check your drive properties: browse "My computer", right-click on the drive letter in question and select properties. The formatting (file system) will be shown near the top of the page. B9. How can I disable default ZIP folder handling? To turn off this feature you need to unregister the DLL that "simulates" zip files as folders. Just run this command: regsvr32 /u zipfldr.dll from within your system directory where this DLL is kept (%WINDIR%\SYSTEM32). Then just allow your archive program to take over the ZIP file associations. However keep in mind that by disabling the default behaviour you miss out on features xplorer² offers within zipfolders, like content preview, thumbnails, comparisons etc. For windows vista there's a registry workaround. For windows 7 you must change access permissions to a registry key too. B10. Why does xplorer² stay in memory after I quit? If you have associated xplorer² with your filesystem folders during installation (see FAQ C1) then by design the process xplorer2_UC.exe remains in memory so that next time you click on a folder it will respond quickly. If you want to permanently exit xplorer² then use File > Exit menu command. B11. Can I browse and search within other compressed archives? Sure, you just need to install a shell extension and then you can browse into 7Z, RAR, ISO and many other archive types, in the same fashion as with ZIP "folders". This requires windows XP or later. Assuming that your network is up, but it is very slow, try increasing your ping timeout to something bigger than the default 5 seconds, using Tools | Advanced Options menu. B13. Does xplorer² work in very deep folders? Since version 3.4 xplorer² is fully long path aware, working in folder paths above 256 (MAX_PATH) characters long. However using big folder names in windows is still not recommended, because most programs cannot open documents from such deep folders. See here for more information. If you run xplorer² lite (free version) on non-english Windows (Chinese, Japanese, Hebrew etc), it may not be able to read filenames with native characters; instead of the filename you see question marks ??????.TXT. The solution for the lite version is to adjust your system's language to match your locale. Or just download the professional version which is Unicode and will show all filenames properly. C1. How can I make xplorer² the default application for all my folders? During installation you can tick a checkbox to have xplorer² open all filesystem folders when you click on them (replace windows explorer). There are a few folders that are "virtual" and cannot be associated with xplorer² in this fashion (e.g. My Computer); you access these from within xplorer² instead. There are a couple of possible explanations. If this only happens to large image files (above 1MB) you may need to increase the thumbnail size limit found in Tools | Options | General. If the problem isn't size-related and started after you installed a program, your registry may be corrupted. Please see KB article 192573 for more details. Given that extracting files from archives, FTP and other slow folders is rather expensive, xplorer² has a default limit of 512KB; files above this size won't be extracted and hence won't be previewed. To increase this limit use Tools | Options | General. C4. Doesn't xplorer² support path autocompletion? xplorer² does support autocompletion but not like windows explorer. You start typing part of the path and then press <F1> key a few times till you get the name you are after. Insert a backslash \ to start a new subpath etc. If you prefer explorer-style autocompletion please check the relevant box in Tools | Options | Advanced. Some office applications like PowerPoint automatically include previews in their files, hence ".ppt" files always have thumbnails visible in xplorer². Other applications like Word need some coercing for including previews in ".doc" files. You'd have to use File | Properties menu in Word, and check "Save preview picture" box in Summary tab. On the down-side the file size may increase a lot. If you are only interested in plain text previews, xplorer² can extract text automatically from Office documents, if you have windows 2000 or later. xplorer² caches the bitmaps of items you preview either in the quick viewer or as thumbnails. This may lead to high memory consumption when you are browsing folders with a lot of pictures. To reclaim memory you can refresh the folder contents using <Ctrl+R>. The memory will be released when you browse another folder anyway. C7. I love the extended file information; are there any more columns? xplorer² will automatically integrate with any shell column handlers you install for your windows explorer, even for windows vista and 7/8/10. As a sampler you can try the following free shell extensions. You can even use the new metadata in file searches! Please note that we are not affiliated with these programs and make no claims for their stability etc. Most likely you've fallen victim to microsoft's security panic introduced with XP SP1. You can bring order to your PC with a simple registry hack described in the forum. You can also switch to the Native preview tab. C9. How can I print folder contents? You can't print directly from xplorer² but you can extract the information you see as text using Edit | Copy Columns menu. This puts the selected items in the clipboard which you can then paste into any program e.g. Excel and print from there. You can also use Export CSV menu command directly. C11. Can I put any menu command on a toolbar? The "lite" version lacks the powerful find files command of the "pro" xplorer² and by default <Ctrl+F> will launch Windows Find dialog. If you don't like — or even don't have — this system service you can associate your favorite external find program, setting the registry value szExtFindFiles. See registry.txt for more details. D3. How can I search for text inside PDF documents? D4. How can I search faster? E. Known problems and "features"
It is unfortunate that many 3rd party NSEs are designed only with windows explorer in mind. Such extensions will run into trouble when accessed from xplorer². The symptoms vary according to the level of compliance of NSEs to the shell model, so you may read some folders but the details are wrong, or you can't manage items, or you can't read from a virtual folder at all. We consider these products to be at fault for such problems, not xplorer². Properly designed NSEs — like most of the microsoft ones — will work without a glitch. The FTP namespace extension provided by Internet Explorer — which xplorer² taps into — is arguably not the best NSE designed by microsoft. There are a number of small glitches, including file dates being doubly-adjusted for timezone, autorefresh playing up, etc. The obvious downside is that you expose your passwords in plaintext. xplorer² uses Internet Explorer for FTP folders. If you type a FTP URL (ftp://...) in IE and doesn't work or it returns a webpage-like listing, xplorer² can't read it either. Some times you can improve FTP through IE's Tools | Internet Options | Advanced: "Enable folder view for FTP" and "Use passive FTP". Please contact your administrator for further details. Although xplorer² will properly read subfolders within zipfolders, it can't open embedded zip files. There is no known workaround. Recycle bin is one of the few virtual folders that doesn't play by the rules, so autorefresh will only work when you permanently delete files from it. For all other cases (e.g. after restoring files) you will have to do a manual refresh with <Ctrl+R>. Welcome to 64 bit hell. Shell extensions like context menu handlers are DLLs that need to match the 32/64 bit format of xplorer². You can install the dedicated 64 bit xplorer² (see FAQ A19) but unless all your extensions are 64 bit you may miss a few. For more information see this blog article. When you are browsing a removable drive or USB stick with xplorer², it locks the active folder (current directory) so the drive cannot be ejected. The simple solution is to browse away to a different folder e.g. C:\ and then the drive will be released. Another possibility is to right click on the USB drive letter in the drivebar and choose Eject from the context menu. If you still have problems fully quit xplorer² using <ALT+X> then eject the drive. The documentation relies heavily on demo videos that show you how to get things done with xplorer². These play in your internet browser, but require the shockwave flash (SWF) plugin which is a free download. The easiest way to watch a video would be to use Internet Explorer or Edge browsers which already have this plugin installed and updated with all the security fixes. If your display settings use Large text (or high DPI), your browser will probably zoom all content and xplorer² demo videos will look funny. To improve the video quality press <Ctrl+Minus> keys to zoom out slightly (or hold Ctrl while you turn your mouse wheel).